Looking for ways to stand out from the crowd in your industry? 20,000+ industrial suppliers and service providers have taken advantage of featured and preferred listings on IndustryNet to showcase their best qualities. 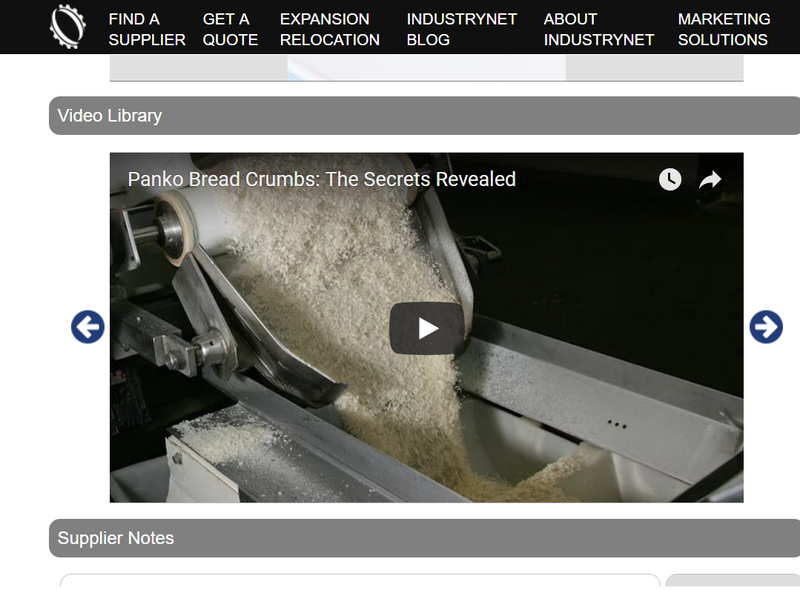 By posting videos and photos, and adding catalogs or cover art, they rise above the pack by making their listing appealing to the millions of industrial buyers that visit IndustryNet -- the nation's premier industrial marketplace. Click here to learn more about IndustryNet's marketing solutions. Getting the message out about your company and its many strengths can sometimes be difficult. Budgets aren't always available for marketing efforts. In fact, a recent survey of industrial marketing experts showed only 38 percent of respondents expect their spending to increase in 2018. Nearly half say it will likely remain the same as last year. Even with great marketing strategies, many companies have difficulty understanding how much their efforts really help the bottom line. The industrial sector has somewhat complex sales channels that make it difficult to attribute sales directly back to marketing efforts. Thus, correctly calculating ROI continues to pose a challenge as it has been for many years. In fact, more than half (52 percent) of survey respondents do not measure ROI because they feel "we need an easier way to do this" and "we don't know how to do this." 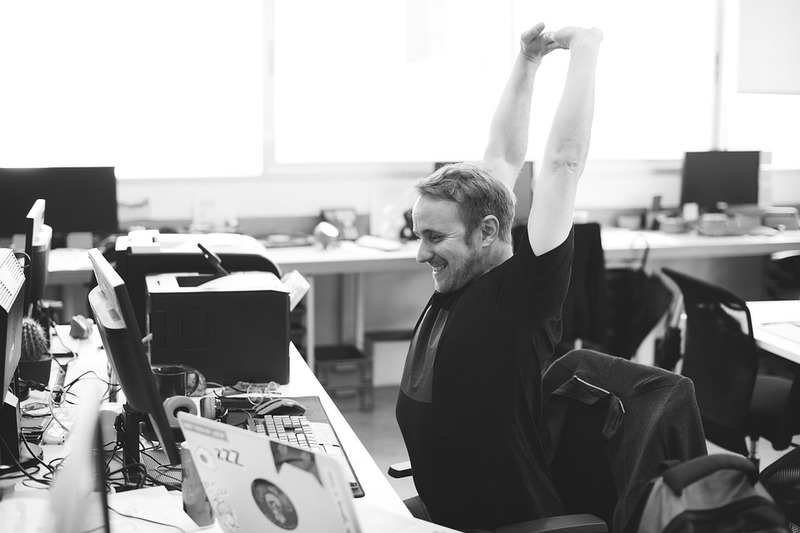 Even when 70 percent of respondents note they can provide solid numbers for how marketing has increased audience engagement and number of leads, they are less likely to be able to show how it has increased sales. Marketing is evolving because consumers don't simply want things to be sold to them. Many B2C brands are getting innovative with their efforts. They understand that banner ads don't pull in results. Furthermore, technology is blocking many of those ads. The industrial sector is B2B, but that doesn't mean engineers are suddenly influenced differently just because they are at work. They look for things in the same way B2C buyers might. In fact, research shows 60 percent of engineers find information from digital publications and another 53 percent find it on vendor websites. It's important to note that final decision makers are the heaviest consumers of this content. Like B2C marketers, B2B marketers have to understand how those decision-makers consume content and, thus, create that type of content to reach buyers effectively. Video, infographics, white papers and ebooks are just some content respondents say they consume on a weekly basis. Understanding the purchasing motivations of the target audience and effectively engaging those individuals through the content they most enjoy makes all the difference in driving interest and converting to sales. IndustryNet helps more than 20,000 companies market online. For more than 100 years, we have connected buyers with suppliers. 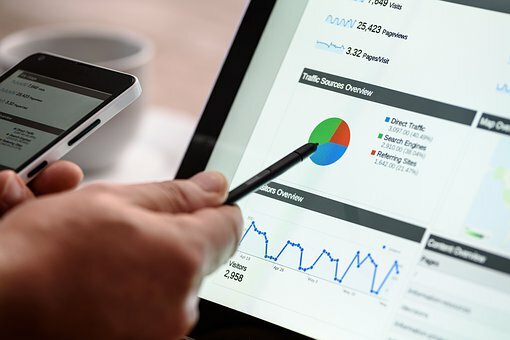 By reaching a unique target audience, we complement your existing marketing efforts. We place directory-style listings exactly where your potential partners and clients are looking for your product. Additionally, you can drive ever-important organic traffic to your company's website via an IndustryNet listing because it is a "blocker-free" space. Click here to learn more about featured and preferred listings on IndustryNet. You're not going to simply get a bot headed to your website. Through our listings, you're getting a truly interested user who may be a potential customer looking at your website. With a directory consisting of more than 20,000 listings, making your company stand out on IndustryNet is important. Research shows using video has long been a great way to engage users, boost traffic and nurture leads. Today, 89 percent of manufacturing marketers use videos for content marketing purposes. 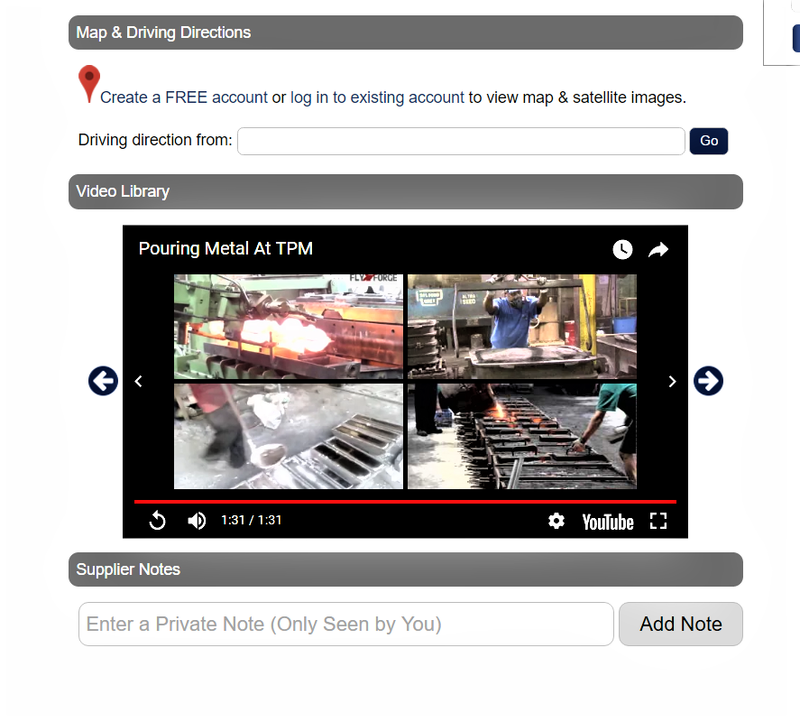 According to Industrial Marketing Today, "Manufacturers are using videos as part of their content marketing strategy to get found by their target audience and drive qualified traffic back to their site where they use other content to capture and convert more site visitors into qualified prospects and sale leads." While adding video is powerful, different users consume content differently. IndustryNet listings allow companies to add videos in addition to logos and cover art that help boost brand recognition. Photos, downloadable catalogs and social media links can also be used to enhance listings. Keep in mind that younger engineers - 45 years old or younger - are often tasked with submitting the initial research and findings to senior stakeholders. This demographic is very social media savvy. In fact, LinkedIn is the only major social media platform for which usage rates are higher among 30- to 49-year-olds than among 18- to 29-year-olds. There are a number of companies that have upgraded their listings on IndustryNet. These examples show not only what is possible, but also how these manufacturers break away from the pack. Tate Andale Inc.; Baltimore, Maryland. Founded in 1924, the company is owned and operated by the grandson and great-grandson of the company's founder. Tate Andale is focused on the design and manufacturing of build-to-order, heavy-duty, fluid control equipment, including industrial strainers, filters, valves and heat exchangers. Their logo and cover art pop out at visitors within their listing. Social media links connect to LinkedIn and Facebook pages. A direct link connects visitors to the company website. Phone and fax numbers as well as email links make it easy for buyers to contact the company. Hudson Printing Co.; Salt Lake City, Utah. 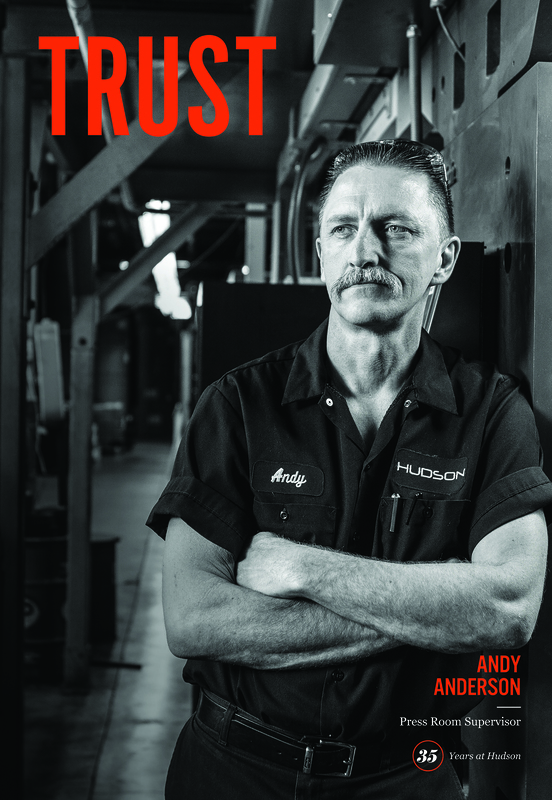 Founded in 1909 as Stevens & Wallis, the Hudson Printing Co. originally began as a book publisher and printer. In the digital age, the company knows they have to "reinvent print" and explore the connection between digital and print media. They acknowledge that this means "forging deeper, stronger relationships with our customers." Within their listing, they have upgraded to show their company name in bold text. Cover art and a logo also enhance the look. Links to five social media platforms provide a variety of ways for visitors to engage and have a conversation. A photo library showcases images of employees and equipment. In the video library, CEO Paul Hudson explains how and why consumers still look to print products: "Print is not dead." In this short video he is quickly able to convey his passion and dedication to the business. Phoenix Heat Technology Inc.; McQueeney, Texas. 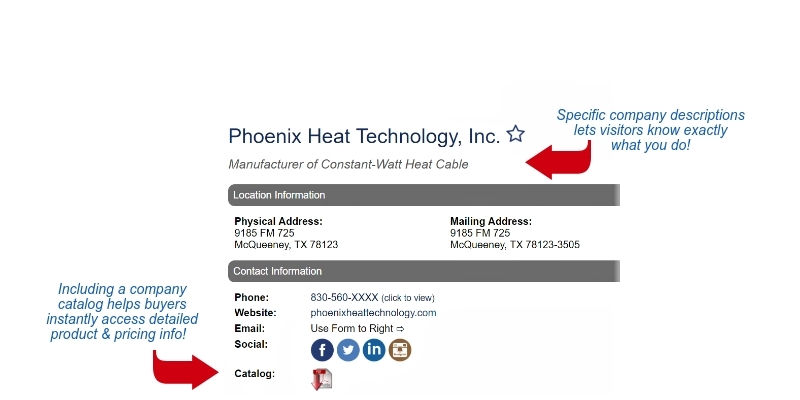 In business for more than 20 years, the company provides the highest quality-controlled constant wattage heat trace cable on the market to date. The company's bright logo and cover art jump out immediately. The listing is enhanced with links to four different social media platforms. Potential customers can immediately download a catalog that provides information on various products as well as their applications. A phone number and URL provide easy access for buyers to contact the company directly. A photo library displays various cables. In the video library, visitors can watch a helpful how-to video explaining the process for an end termination. Vision Engineering Inc.; New Milford, Connecticut. 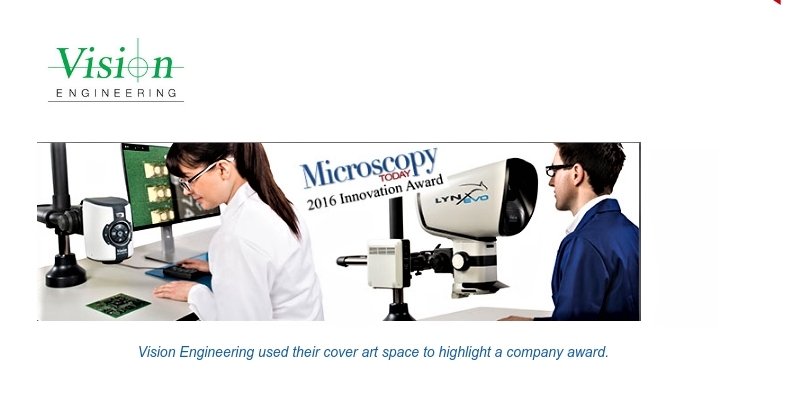 A world leader in optical inspection and measurement systems, the company is a leading-edge manufacturer of patented stereo microscopes and noncontact measuring systems. Visitors to their IndustryNet listing can quickly download a catalog featuring many of their products. The video library showcases the company's main promotional video. Social media links such as LinkedIn, Twitter and YouTube, where a number of other videos are included in their channel, are also provided. Phone and fax numbers, an email form and link to company website provide direct access to Vision Engineering for potential buyers. KB Delta Inc.; Torrance, California. Established in 1982 by Boris Giourof, a recognized reliability specialist in the refinery and gas compressor industry, KB Delta has become the premier compressor parts manufacturer and supplier of compressor valve parts for the natural gas, air, refrigeration and PET industries worldwide. A photo gallery features a number of small and large parts. In the video gallery, a three-minute video shows the many stages of the production process. Colorful cover art and the company logo brighten the page. Interested visitors can quickly connect with the company via phone and fax numbers, an email form and link to company website. PTR-Precision Technologies Inc.; Enfield, Connecticut. A world leading manufacturer of electron beam welding equipment (EBW), PTR also assists customers with weld process development and provides maintenance and spares support for EBW systems. In the listing, videos show EBO Jump Multi-Pool Electron Beam Welding, Blind Electron Beam Weld Pass and Radical Electron Beam Welding. A link to the company's YouTube channel allows interested viewers to see other short videos produced by PTR. In addition to phone and fax numbers, an email form and links to the company website, Facebook and LinkedIn are also included. Visitors can download a catalog that shows a variety of systems and the industrial applications. A photo library on the listing also provides the opportunity to flip through and view images of these systems and the facility. The cover art provides an 800 right at the top of the page for visitors to quickly see. Other direct phone and fax numbers, email address and the company website are listed. 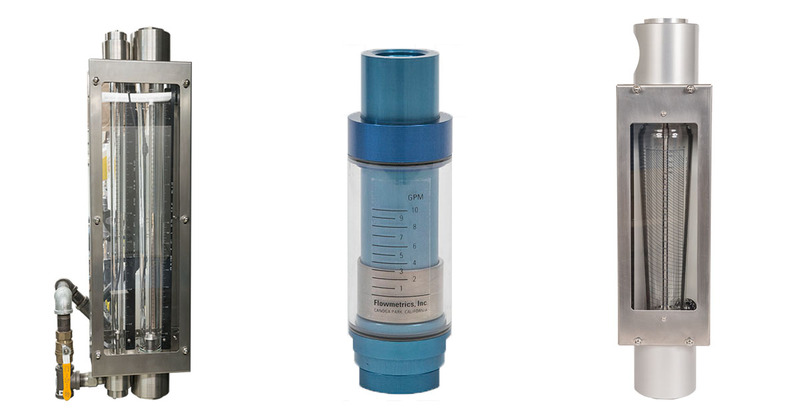 It is possible to download a catalog from this leading manufacturer of flow meters and associated flow computers. The photo gallery provides close-up images of many products. Wilson-Hurd Mfg. Co.; Wausau, Wisconsin. A very colorful cover art image and logo make this page pop for this industry leader in custom metal nameplates, plastic overlays and membrane switches. This listing is fully enhanced with links to seven social media platforms, phone and fax numbers, email form and company website URL. Visitors can download a catalog page that includes a number of capabilities. 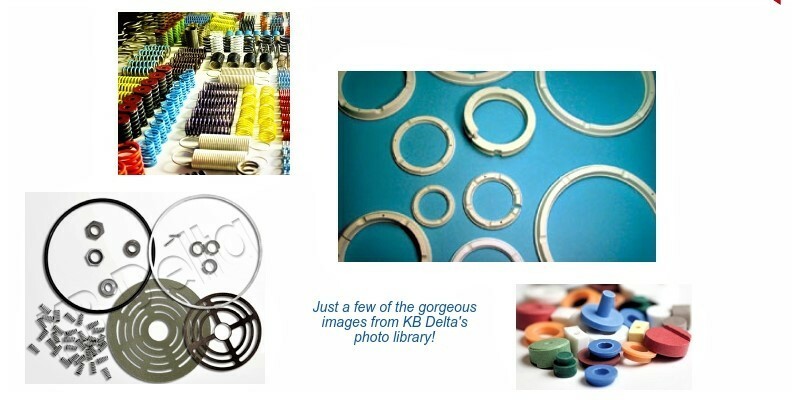 The photo library includes images of the facility as well as different products. The plant is described and shown on a video uploaded to the video library. The YouTube link connects directly to the company's channel where numerous other videos can be played. A link to other articles on IndustryNet about Wilson-Hurd are hot-linked at the bottom of the page so visitors can learn more about the company and its role within the industry as a whole. Posner Industries; Capitol Heights, Maryland. Founded in 1960, this family-owned and operated business is a major distributor of steel products and contractor supplies. Visitors can connect directly to the company via listed phone and fax numbers, email form and company website URL. Links are provided to access the company's five social media accounts, including LinkedIn, Twitter, Facebook, Google+ and Instagram. A downloadable catalog provides information on six brick-and-mortar locations and listings for more than 750,000 products the company offers. A photo gallery features images of the facility. 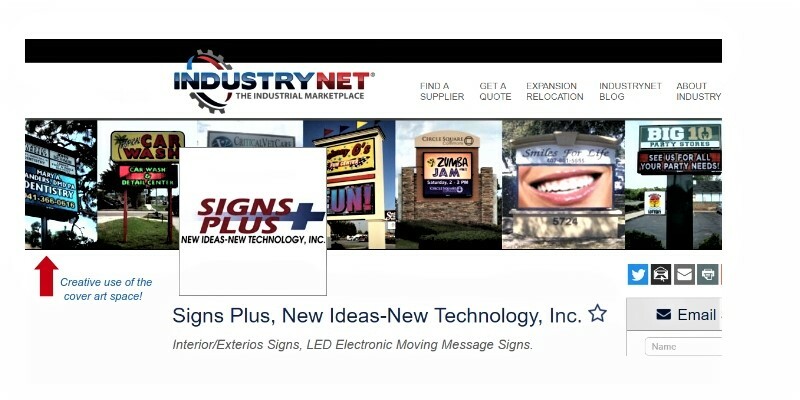 Signs Plus, New Ideas-New Technology Inc.; Sarasota, Florida. Within the cover art, visitors can quickly see a number of examples of the company's work. Since 1988, this family-owned business has been providing the finest indoor and outdoor signs at the best possible price. Further down on the page, visitors can flip through the photo gallery and view even more examples of LED and Polyarmor signs. The video gallery features a video explaining why customers should choose the company for their sign needs. Equipment options are explained in detail. Additional videos can be viewed on the company's YouTube channel via the link included in the listing. LinkedIn, Facebook, Pinterest and Google+ social media links are also provided. Visitors can connect directly to the company via phone and fax numbers, email form and company website URL. CRC Industries Inc.; Horsham, Pennsylvania. Visitors can click and watch the video to "Unleash the Smartwasher Bioremediation System" offered at CRC Industries. A link to the YouTube channel leads to more than 20 videos that provide even more information about this global supplier of chemical solutions. Other enhancements to this listing include logo, cover art, phone and fax numbers, email form, company website URL and social media links. A downloadable catalog provides more than 70 pages of products and information. Liftec Inc.; South Plainfield, New Jersey. The red, white and blue of the company logo and cover art make this page pop out immediately. Links to Facebook, Twitter, LinkedIn and Google+ are included as well as a phone number, email form and company URL. The downloadable catalog provides more information about this business, a provider of high-quality forklifts and material handling products for 40 years. The facility is featured in the photo gallery and the video gallery allows the visitor to tour the company with a host from Popular Mechanics. Span Tech, LLC; Glasgow, Kentucky. The photo gallery features a number of images from this company committed to building the best conveyor systems possible. Span Tech is recognized as a global leader in developing unique, customizable technical solutions for processing applications in core industries that include: food production, beverage production, manufacturing, packaging, distribution, cosmetics, pharmaceuticals and e-commerce. In the video gallery, visitors can click to learn about the employees of the company who are more like family. Visitors can connect directly to the company via phone and fax numbers, email form and company website URL or connect to the company's social media accounts: LinkedIn, Facebook, Twitter and YouTube. Texas Precision Metalcraft Inc.; Sugar Land, Texas. The company has produced precision investment castings since 1969, and it has a team of engineers and sales people to work with customers from the initial design to the delivery of parts. The videos within their listing show the process of melting and pouring of metal. A social media link takes visitors to other YouTube offerings from the company. Other enhancements to this listing include cover art and logo, phone and fax numbers, email form and link to the company's website. Salta Pipe Co. Inc. Abilene, Texas. Just below the cover art, logo and bold text of this enhanced listing is a description that notes, "Salta PVC Lining Process was designed over 50 years ago for handling corrosive material in lined pipe for injection & disposal well applications, upsetting tubulars, reconditioned pipe & providing new/reconditioned lined/bare steel tubulars." Phone and fax numbers, email address and the company website are listed, providing a direct connection to Salta Pipe. A two-minute video in the gallery provides an overview for this company that has provided the oil and gas industry with superior products and services for more than 50 years. Upper Crust Enterprises Inc.; Los Angeles, California. The red and white cover art reminds that "all panko is not created equal." If you're not familiar with the product, just under the logo and bold company text is a description: "Your Source for Truly Authentic Japanese Panko Bread Crumbs." A variety of tasty dishes made with panko are included in the photo library. The video library tempts viewers with moving images of variety of food items. Additional videos can be seen on the company's YouTube channel via the link included in the listing. Facebook and Google+ social media links are also provided. Visitors can connect directly to the company via phone and fax numbers, email form and company website URL. The downloadable catalog features a variety of products, including seasoned blends, different grinds and batter mixes. The company logo, cover art and bold company text top the page. Facebook and LinkedIn social media links provide direct connections to the company's social media accounts. 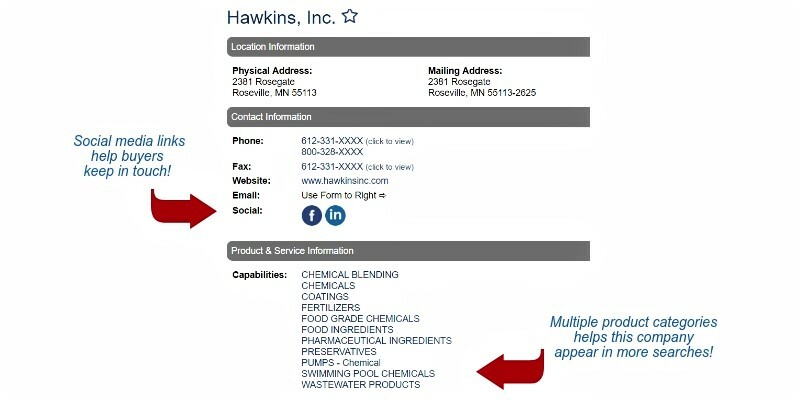 Phone and fax numbers, email form and company website URL make for an easy way to connect to this widely known and respected chemical distributor. Under Product & Service Information on the listing, visitors can quickly see how many capabilities the company has, from chemical blending to water treatment equipment. Tilsner Carton Co.; St. Paul, Minnesota. The company has been providing corrugated products since 1918. A handful of videos in the gallery showcase the company, packaging, pallets, POP displays and the facilities. The photo gallery provides the opportunity for visitors to view a number of products. Potential buyers can be immediately connected via the enhanced listing that includes phone and fax numbers, email form and company website URL. Facebook and Google+ social media links provide direct access with a single click. 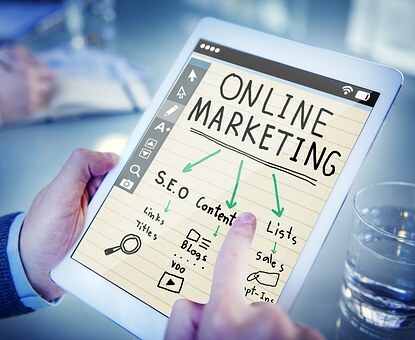 Indeed, industrial marketing may face many challenges, but there are very effective ways to drive targeted traffic to deliver a better ROI from marketing efforts. These examples show the many different ways an enhanced listing can provide additional traffic. If you are looking to get industrial buyers like these to your site, join the 20,000+ companies who are receiving leads, inquiries and website visitors from IndustryNet. Learn more about upgrading your listing.